With an increasing amount of exposure to brands via new media channels and shorter attention spans than ever, we have more noise than ever to cut-through. But with all that noise and competition – particularly in the alcoholic drinks sector – how do you garner attention without screaming at your audience? Last month, Bombay Sapphire launched a pan-European campaign called The Grand Journey. The activity consists of a 60-minute live experience that immerses audiences in the drink’s brand story. The brand is visiting seven European cities with a bespoke toolkit, converting each location into a specially designed avant-garde style train station and train carriage. 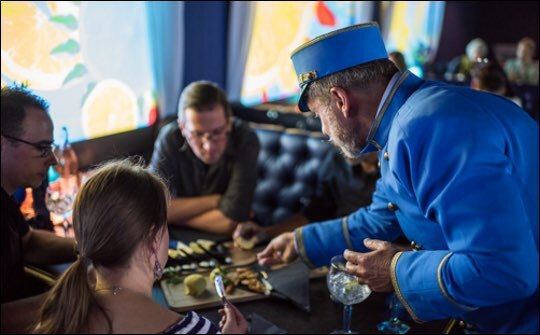 Passengers ‘board’ the train each evening before being taken on a virtual tour around the world that fuses together art, culture and flavour, inspired by the ten botanicals found in each bottle of Bombay Sapphire. The campaign capitalises on the current refusal from audiences to simply be taken on the traditional linear narrative that brand advertising has offered in the past. Audiences now want to explore the story behind a product, not just the product itself. From the train guard to the grand dame, actors take audiences through a live and immersive adventure across the globe with the train ‘stopping’ at each of the ten locations that Bombay’s botanicals originate from, such as Spain, Ghana and China. At each location guests are given an experimental cocktail, made by an expert mixologist, inspired by the country they’d just travelled, as well as a live performance, such as an illusionist, or a specially created food dish, aimed at tantalising and attacking their senses, triggering their imagination and bringing to life the story behind Bombay Sapphire. This blend of brand experience and immersive acting plays into a wider trend where event marketing budgets are on the rise as consumers begin to favour this level of communication over traditional marketing channels. This is just one of many recent events created by drinks brands that have sought to harness the power of immersive theatre to bring to life their products. But why are huge brands beginning to focus on brand experiences? And what benefits does this channel bring to drinks marketers? Consumers increasingly want to be part of the story, to play a role in the unfolding narrative. Brand stories are hardly ever linear, and consumers are no longer just along for the ride. You can see this rise in the form of brilliant theatre productions from the likes of Secret Cinema, You Me Bum Bum Train and Punch Drunk leading the pack. These are immersive theatre experiences that put the audience at the centre of the show, immersing them in their world and letting them interact with the show on a level never been done before. This rise has been mirrored in the alcohol sector, where marketers are beginning to understand that to tell their brand story effectively, and stand out, they need to immerse audiences in their products. The alcohol sector is perfect for this. Bombay Sapphire took consumers on a journey through the brand’s story, helping to make it a much talked about event. While Glenfiddich’s Mind of the Malt Master delivered a VR experience that allows consumers to explore the history of the brand, from the Scottish countryside where it was conceived to the distillery where it is produced today. The whole tour, hosted by a Scottish guide for authenticity, explains in-depth everything that Glenfiddich represents. The VR film has been used in a series of experiential tasting events in leading bars and travel retail environments across the world, as well as being available on YouTube and Facebook for the general public. What’s clear is that if you can give audiences a good, immersive experience – whether in the physical or virtual world – they’re willing to share their experiences through word of mouth, or online across social platforms. Success is therefore measured by how far your brand story travels. This can be amplified even further by targeting the right influencers, popular within your target demographic. Make the experience as amazing as possible and they will feel compelled to share their story. And as they retell this story, this drives word-of-mouth and helps the story travel far, truly embedding the brand with consumers and leading to a successful campaign. We’re in a golden age of immersive live experiences. Younger audiences value experiences more than any generation before; a trend we expect to see increasing as this audience matures and gains more spending power. By heightening senses and going the extra mile, we can open audiences to our brands like never before – engaging them with our brand and telling a story that they want to share with their peers.